What is the best training exercises for table tennis? Today, let’s learn from the best Chinese table tennis players: Zhang Jike. How they train in their normal practice drills. Warm up: Firstly, you should warm up. Movement: Chinese coach focuses a lot on footwork. That’s why “movement” is the next training step. Impact power: Then, they practice to add the power to the shots. The concept “Power from the ground” is very important. Seve and attack pattern training: Chinese players repeat the multi-ball by pattern a lot. Repetition is the key to master a new technique. Return the serve: Serve and answer to the opponent’s serve is crucial in the modern table tennis. You should quickly control the pace and attack first. Coach’s modification and improvement: Finally, the coach will analyze your technique. They help you to improve your techniques. Even the elite top player needs the coach’s advice to improve. The Chinese players always start of the training session by Forehand-to-Forehand warm up. This stage, you can feel the ball, and the spin is the most important here. See how well Zhang Jike rotates his waist to generate the spin of the ball. After 5 minutes warm up, you should quickly focus on the footwork. It’s very important in table tennis. The simple exercise is doing the backhand-middle-to-forehand footwork. One ball to your backhand side, and the next ball is sent to your middle, and then to the wide forehand. And you should hit the ball with your forehand. You need to move first and then hit after. Don’t hit before moving! That’s why, the movement is the most important training. After the warm-up, you should train your legs! train how to move correctly! When Zhang Jike missed the ball, he looked at his “rubber”. There is nothing to look at. However, it’s the way you gain confidence! You say that my techniques are correct, maybe my rubber is wet! No! It’s just a bad habit! However, it gives you confidence! After getting the “feeling” during the warm-up session, and the footwork. You should train to improve the power of your shots. Remember: The power comes from the rotation of the lower part of your body. Now, focus only on Zhang Jike legs. He always makes a “small step”, and generate so much power with his legs. The legs are the most important part in table tennis! Focus on the lower part of your body during your training sessions. This is the secret of Chinese players ! They are very strong in a real match situation ! Because they have trained for that specific situation every day, 10.000 times. They have confidence, consistency and stamina! Have you seen the tactics here? Zhang Jike served short to the middle, and then push long to the opponent backhand, and then counter attack ! This is specific tactics if your opponent has a weak backhand. “the service and the return of service takes 50% of the stroke in table tennis”. This is correct! Serve and attack is the most important aspect of table tennis. Zhang Jike is practicing the Backhand flip the ball at the Forehand side. This is his specialty! He is very comfortable to flip the ball (short/mi-long) at his Forehand side. Watch it carefully! You will see that the timing is very important in the Backhand flip. Zhang Jike waits for 1 second, where the ball start to fall, then he uses his wrist to flip the ball. Why should we flip the ball at the early falling? Because this is the moment that the speed of the ball is lowest, it is almost fixed, and further, the spin of the ball has decreased. So it’s safe to flip the ball now! More consistent and you can flip the backspin or topspin ball at this moment. In service-return, “consistency is the most important”. However, even the World Champion Zhang Jike, he is not perfect! Chinese coach staff always find a way to improve his technique. The head coach asked Zhang Jike now, to use Forehand flip at his Forehand side instead of his favorite Backhand flip. But it seems difficult! Liu Guoliang said that Zhang Jike should fix the moment that he flips the ball! Zhang Jike didn’t flip at the “steady moment” – when the ball speed is lowest! However, Liu Guoliang has failed to flip it correctly, you should train everyday to master a new technique! Do you know him? I will explain you later ! psychology of table tennis. That’s why, they always find a solution when Chinese team counters a difficulty. 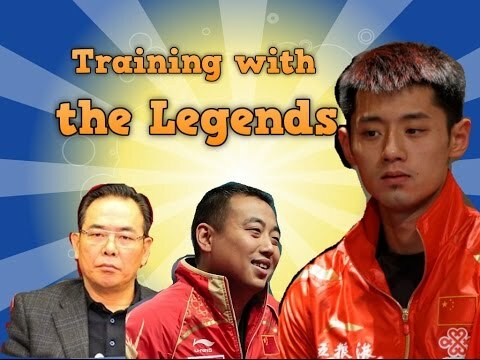 He is Cai Zhenhua, former table tennis player, and former head coach of China team from 1991 to 2004. He played an important role in leading the Chinese team to its comeback. In 2007, he became the Deputy Director of General Administration of Sports. He is the president of the Chinese Table Tennis Association, Badminton Association and Football Association! Mr. Cai is a real big boss. Look, even he was very busy as a big boss in Administration tasks. He is very fluid and very good! He flips the ball easily! Rotation and fluid! He said that Zhang Jike should stand closer to the ball. To flip the ball with the Forehand, strike the ball near the body will give you more control. The elbow should be low, and flip when the ball is at the falling stage. Zhang Jike has hit the ball too late. If the ball is too short, you should drop shot. Zhang Jike does it very well! He touches the ball very early, when the ball is just bouncing, at the bouncing phase, this makes the ball very short. However, Forehand flip the ball is much more difficult ! Zhang Jike always prefer to Backhand flip this ball. Maybe, Ma Long is better than Zhang Jike at Forehand flip the ball ! – Thank to Cai Zhenhua who has spent time to visit and encourage Chinese Team before the Olympic Games. – Even Zhang Jike is the World Champion, he is not perfect. Chinese players always train to be better, never stop training. – For us, amateur table tennis player, we should focus on the “timing”, when to hit the ball. (As we often hit too hard, just focus on hit faster, harder, but don’t know exactly when to hit the ball). – To flip the ball, wait a little, wait when the ball is starting to drop (wait for about half second when the ball is at the higest position, then it will drop), that’s the moment we flip the ball, both Forehand and Backhand. Because at this moment, the spin is reduced, we don’t “eat” the spin, and the ball is very stable, we can see clearly the ball. – To drop shot, we should touch the ball when the ball is about to bounce up (early of bouncing stage). Because the ball is lowest now, and the returned ball is low too. If you drop shot too late, at the highest position, it’s very diffcult to make it low, and the opponent can attack it easily. – You should also practice every day the “pattern situation” for the real match. This gives you confidence and the consistency! Try to attack the 3rd ball and the 5th ball. – You should also improve your movement, don’t train too much the ball “on the table”, but train more the ball where you need to move. Remember “Hit the ball by your legs, and Power From the Ground”. – In your daily training, focus on the “feeling, the timing and the consistency” this is the fastest way to improve your table tennis. Don’t just smash, or hit the ball, but you should spin the ball. Coach EmRatThich, i have a doubt, will u pls correct it? Should I play Backhands the same way, extending the elbow to left-outside, or it has to be played within the body line? Backhand is not the same as forehand. For the backhand stroke, the power is very compact. So you need to use a lot of wrist, and the forearm and the elbow. Hello again, first I want to say thank you for your advice on my last question it helped a lot. So I have been playing for quite awhile with DHS Hurricane 3 NEO Black on my Forehand and it is great for looping underspin but I have trouble with forehand drive not sure if its a technique problem or if a similar but different rubber might help so I have been curious to switch either to Regular Hurricane 3 or A DHS SKyline 3 or Sklyine NEO 3 What are your thoughts? I play with Tenergy 80 on the backhand and I am interested in finding a Chinese comparable and more affordable option so I can switch more often to keep better consistency because I play around 20 hours a week. I would like to know your opinion on this for it has served me well so far thank you. EmRatThich, your videos have helped me get better at table tennis! I currently play with the Nittaku Flame Carbon blade, Hurricane 8 FH, and Andro Rasant BH. Should I switch to an OFF- blade or keep my carbon blade? I get good feeling on the ball but I’m thinking I need something faster. I’m trying to model a looping playing style similar to Ma Long’s! I am Amit Modi from Mumbai (India), I am engineer and used to play TT at amateur level. My son Jash Modi is very much hard working , and committed player and wants to play and perform at International Level. Currently I am training my son. He is Currently India No.3 and plays well. To compete with international level players , i want to put him to a Chinese Training Academy for advance learning. Can you please suggest me a good place in China, where we can go and get good training??? I have seen your videos and then teaching my son which is helping him developing his game. You are doing great work. You are really a great men as you are doing this work for the betterment of the game and players. I am very much thankful to you for doing great favor for us. Please guide me with suitable training place.